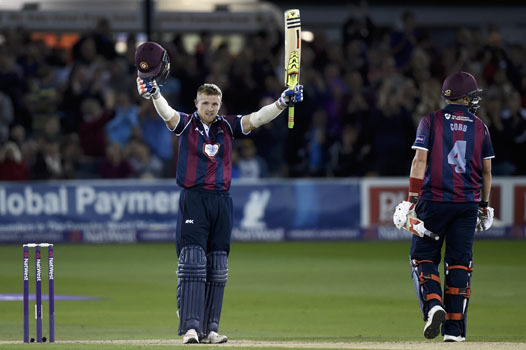 David Willey won the Walter Lawrence Trophy in 2015 with a breathtaking 40-ball hundred. The 25-year-old all-rounder thrashed 10 sixes and 7 fours in his century for Northamptonshire Steelbacks against Sussex Sharks in the NatWest t20 Blast quarter-final at Hove on August 12, pipping two world-class batsmen, Brendon McCullum (42-baller) and Chris Gayle (45-baller) to the crown . Willey took 3 for 22 before his stunning innings – the fastest in the T20 format by an English batsman – which included an explosive over in which he smashed 34. The left-handed bat and left-arm fast medium bowler, who was unsurprisingly named Player of the Match, commented: ‘I started quite slowly and didn’t pick up the pace of the wicket, but I used the wind and the short boundaries to my advantage. The guys know if I stand still and give myself a chance the boundaries aren’t always big enough’. Willey, the son of former England all-rounder and umpire Peter, has played in six One-Day Internationals and is a key member of England’s T20 International side which thumped New Zealand earlier in the season and beat Australia in a nail-biter recently. He has been selected for the England ODI and T20 squads to play Pakistan in the UAE in November.